This publication is based on research we conducted over the last couple of months at the intersection of blockchain and telecoms. My Untitled INC fellows Dr. Oliver Krause, Gregor Harter, Peter Milan Trapp, Thomas Euler and Simon Schaber provided very valuable feedback and inputs to the analysis. What is covered here presents only a small part of our findings and solely focuses on the New Kids on the Block. There is much talk in town about blockchain in banking, logistics, energy and health. But did you ever wonder why there’s little buzz about blockchain in the telco sector? Turns out that there is much more activity than you might expect: Plenty of use cases are going after efficiency improvements and others are experimenting with entirely new services & business models. Moreover, some promising proof-of-concepts have already been delivered – and New Kids on the telco block raised more than $270m on top of telegram’s $1.7bn. Traction is increasing: The Carrier Blockchain Study Group expands its footprint, Swisscom launched its Blockchain AG in 2017 already, Colt/PCCW performed successful settlement trials, Deutsche Telekom tests, amongst other things, the automatic blocking of stolen mobile phones, SKT in Korea plans to launch a blockchain-based asset management and payment service … and that’s only a small excerpt of what’s happening in the ecosystem. There are other interesting activities by telecom regulators, equipment vendors and device manufacturers too. But these are the ‘Old Kids’. Who are the New Kids on the telecom block? What services do they (plan to) offer? How do they innovate and are they threatening established players? Marketplaces for sms, voice and data services: The principle business idea is to offer unused capacity, be it sms, voice minutes or data, on a marketplace to other users and settle transactions via crypto-currency micro-payments. There are numerous variants to this concept – ranging from gifting data or sms (Airfox) to publishing data plans as smart contracts (Bubbletone) to blockchain based systems that facilitate the purchase and sale of bandwidth among relays, proxies, and users (Orchid). It’s important to note that most of the projects in this cluster require contractual arrangements with network providers and thus are operationally not pure peer-to-peer plays. Ad funded voice data plans: Mobilink-Coin intends to build an ad-funded mobile voice and data service with a custom SIM card and network of MNO/MVNO relationships, whereas Open Data Exchange for example envisions a global marketplace where publishers and internet service providers can transact to deliver free internet access to consumers. It is not always clear from the whitepapers and publicly available information, though, how the monetization will exactly take place and which media assets are going to be used. In particular mobile screens and in-app adversiting have their limitations. Encrypted messaging, storage and VPN: The Mysterium Network for example falls in this cluster. Mysterium Foundation is developing an open source software, which powers a decentralized network of secure VPN nodes. The software allows people to buy and sell unused network capacity. Other players like Telegram aim to provide next to encrypted messaging also payments, dns, secure storage and further services including 3rd party enabling. Considering the uptake of secure messaging (Signal, Telegram, Threema and the likes) a whole new ecosystem might arise here. Data and IOT connectivity via alternative networks: Projects like RightMesh, SmartMesh and iungo plan to build device-to-device mesh networks (WiFi, Bluetooth etc). Although the mesh-network idea is principally not new, using crypto-coins for micro-payment and incentivizing the supply-side opens new opportunities. It’s noteworthy that the three mentioned projects together raised funds of $60m via ICOs. This might in ‘telecom dimensions’ not sound huge, but it’s much more than a good starting point keeping in mind that existing network infrastructure is used. Intercarrier settlement and payment: Companies like Tesspay, Clear and UpCo target the wholesale market with blockchain-based services for clearing and settlement using smart-contracts and cryptography. Tesspay’s approach builds on smart contracts to adopt a lender funded pre-payment process in the wholesale settlement chain assuring payment to all parties involved in a cross-border call. Clear is a platform for real-time trading and clearing, and UpCo applies blockchain in the areas of invoice management and SMS communications to improve data security and auditability. New hardware and infrastructure: Ammbr is developing a hardware mesh networking system – Wi-Fi and other technologies, blockchain-based micropayment and self-sovereign identity platform. Skycoin’s wireless mesh network will be based on a hardware backbone providing bandwidth, storage, and CPU power, whereas QLCChain, a platform for sharing telco “assets” starting with WiFi access, is also planning own access points, including LTE-U unlicenced cellular. As a cautionary note: Building telecom infrastructure at scale is a multi-million to billion dollar business and even if niche markets are targeted requires substantial financial resources. Mobile payment and banking: Next to data and voice marketplaces the most ‘crowded’ space for New Kids on the telecom blockchain is mobile payment, money transfer and banking. Obviously, this is close to the origins of blockchain as a technology to facilitate peer-to-peer payments. Telegram with its $1.7bn funding is amongst other areas targeting this space. BlockNum intends to use the PSTN telephone network, SIP signaling and phone numbers as a basis for a new blockchain for transactions. Bitminutes builds on “universal” prepaid minutes convertible into cash, which creates a new asset class providing collateral for consumer loans. Telcoin’s payment/money-transmission token can be distributed through existing mobile operators, targeting roaming and international aid in the future. Do New Kids Rock the Block? So far so good: We found plenty of new business ideas on the drawing board and there’s some funding available. But are these viable businesses? Let’s have a look at the business models first: Many new kids have defined their business models rather broadly and as such target more than one application cluster. Either they might not yet be aware of the operational complexity involved in running multiple models in parallel, or just intend to follow a stepwise trial and error mode, or – worst case – only do so in order to beautify their whitepapers. Moreover, there are substantial hurdles and complexities when it comes to actually realizing some of the outlined blockchain projects: For example, most telecom contracts prohibit resale of unused capacity, price fluctuations make tokens an inconvenient means of payment, there is competition through free WiFi services and network hops from device to device impact speed, latency, and thus the user experience.¹ Nevertheless, drawing from experience in venture capital and digital markets, we assume that well funded projects with strong teams will have the power to overcome the challenges and complexities, find workarounds or partners that help them to succeed. Do the New Kids really threaten established telecom carriers? As of now, it is hard to judge how solid the endeavors are and who will survive or finally succeed. It requires a detailed discussion with the respective teams – beyond their often superficial whitepaper content – to understand the economic, technological and regulatory feasibility of the projects. But what we do notice is that ICO-based funding of projects is rising overall and per project². In addition, more experienced and mature teams enter the space. We currently see only limited threats to established telecom carriers’ core businesses. Right now blockchain and the New kids primarily present opportunity: Incumbents can partner with or invest in projects and help them to unlock the potential blockchain offers with regards to security, new ways of incentivizing market participants or eliminating intermediaries in the value chain where feasible. 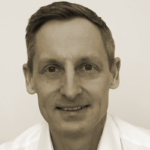 In particular smaller players in retail and wholesale telecom might find it beneficial to cooperate with New Kids – be it to extend market reach geographically and service-wise or to benefit from process efficiencies, e.g. in settlement and payment transactions. 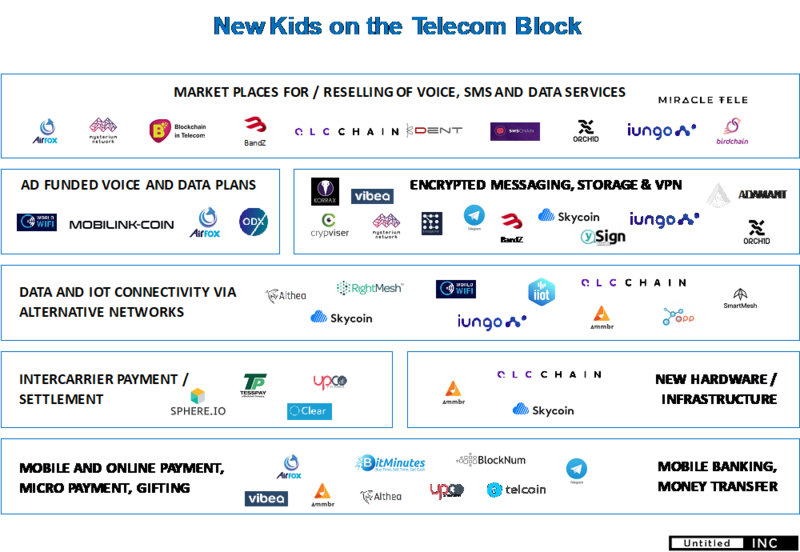 Our Conclusion: Are New Kids on the Block disrupting telecom? Not yet, but be aware it’s a nascent space and few people imagined how skype and whatsapp would disrupt the market when looking at them in the early days. We believe it was probably one of the biggest mistakes of telecom players not to have partnered and invested in these New Kids at that time. ² The marketplace Open Data Exchange (ODX) announced to have raised $60m in a private token sale in July, which is almost doubling Orchid’s $36.1m and meanwhile the largest funding round in the New Kids space – excluding telegram’s $1.7bn.